As the days grow shorter and the Tasmanian winter starts to take its grip, the first frosts for the year set in motion the process of brewing our Hedgerow Barrel Aged Sour Ale. Why dictated by the first frosts of winter? This beer is influenced, both on a timeframe and character level, by the sloe berries on the hedgerows that exist on the brewery farm, and traditionally sloe berries are right to pick once the first winter frosts have occurred. Pick them too early..... fruit is still too hard, and will be extremely bitter. Too late and you run the risk of them becoming all shrivelled up and birds having taken a majority of them prior. Also taken from the hedgerows are the hawthorn berries, which up util recently we'd only though applied a slightly earthy character to the finished product. But on tasting a barrel aged exclusively on these berries, theres a distinct ripe fruit flavour and sweet aroma that we'd underestimated previously. In the previous winters, it seemed that the seasons had all gone to askew, which throws the first frost tradition out of the window and saw us picking well and truly ripe fruit long before the first frosts arrived, and conversely almost into the middle of winter other year when the bushes failed to develop fruit at an early stage due to harsh conditions during late summer/early autumn. 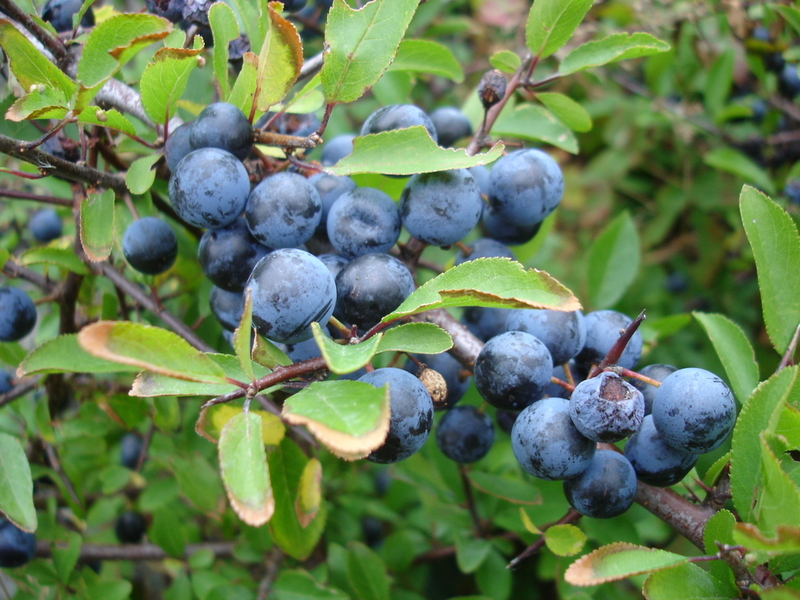 This year seems to be back into the seasonal groove, and as such we picked as many sloes as we could (approx 20kgs) within the past 2 weeks. We will also pick fruit as late into the season as we can, trying to leave them as long as possible on the bush as the flavour develops as they ripen, being deeper, richer and more complex than the fresher tasting early batches, and any bitterness gets mellowed. We'll add these later fruit to a select barrel and se what perceived differences we obtain from the later season fruits. Monday saw us brew the 2017 batch, a task that tested the volumetric limits of the brew system as we attempted to maximise capacity through it. A normal brew length is 1,200 litres, but we managed to tweak out 1,500 litres (great efficiency) and transferred it into our traditional open top fermenter which has a greater capacity than the normal brew length conical fermenters, as well as imparting a different flavour and mouthfeel complexity which we are trying to obtain in this beer. The next step is procuring and establishing which barrels we then age the beer on. Initially we were simply going to blend the current batch (2016 release) and free up the barrels that had housed this beer. However we've only just been made aware that the bottles we were intending on packaging the 2016 release into have been hit with an unscheduled 90 day delay exiting France. Not what we're really after when we've already got the new batch in fermenter. All it means is that we'll place into new barrels the recently fermented version, and brew another batch in 90 days when this years release comes out of its barrels. Ultimately we're increasing the volume produce which will see more available and a better blend each year with more barrels to select from. So we apologise for the delay on release of the 2016 version, but trust us it'll be better than before, have a little edge to it both on the product and packaging front, and won't hurt it being in the barrels for a further 90 days. Rest assured we'll keep you posted when its available. Cheers.